I think it is safe to say when Martin Luther posted his 95 Theses on Wittenberg’s Door that he would have imagined the impact it would have 490 years later. It is rather fitting to find myself writing on a medium that has democratized the voice of Christians in the 21st century in a very similar fashion that Luther utilized the Gutenberg Press to promulgate his translation of the Scriptures to the masses. 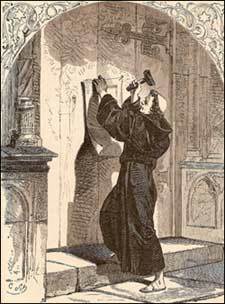 I am quite confident that, were Luther alive today, he would have taken full advantage of such mediums of communication as blogs to proclaim the gospel of justification by faith and herald the battlecry of ad fontes! In the same year I was brought into this world, another birth came about, namely the birth of the Conservative Resurgence of the Southern Baptist Convention. I am forever grateful for the ways in which God providentially brought about the recovery of something which Luther held so dear–the authority and inerrancy of Scripture. With every passing year of my life, the mile marker will remind me that I am a beneficiary of a generation of Southern Baptists who believed that the truthfulness and trustworthiness of Scripture was something worth fighting for and dying for. I pray God never allows me to take for granted the blessings and benefits I have received as a result of such a resurgence, not the least of which include me being saved, licensed to gospel ministry, ordained, and now being theologically trained. Nevertheless, with nearly three decades of the Conservative Resurgence under our belts, the Southern Baptist Convention and the churches of which it is comprised, is no better off now than when we did not believe in the principle of sola Scriptura. During this span of time, we have not seen an increase in people being saved and baptized, even in the midst of a heightened emphasis on church growth and rise of megachurches. We have effectively replaced one bureaucracy with another and have failed to realize the implications of what the recovery of the formal principle in our churches. Setting all political and personal agendas aside, it would be only fair to conclude that the Southern Baptist Convention is currently a denomination that is halfly reformed. So where do we start? I would argue that we must proceed from resurgence to re-formation. By re-formation I mean we must reconsider just how we function as Southern Baptists in cooperation with one another. One of the biggest obstacles of re-formation is our unwillingness to see that it needs to take place. It is a problem that denominational triumphalism and pride keeps us from being truthful when it comes to speaking about our denomination. It is a problem that the churches from whom we get our Cooperative Program money are the last ones to benefit from it. It is a problem that the Executive Committee and entities of the SBC are trying to enforce their agenda on local churches, thereby threatening their autonomy. It is a problem when state conventions and associations pressure churches to turn in the Annual Church Profiles so that they can continue to bankroll the Cooperative Program to fit the bill of their overpaid staff and travel expenses while at the same time telling blue-collar bi-vocational pastors how they should lead and grow their church (from “catalyst specialists”). It is a problem that a significant number of the churches being planted in the SBC are not being sustained while others are being constituted either from new affiliations or a new church splits. It is a problem that we provide celebrity status to certain mega-church pastors in our calendar-driven conference circuit, catering to their influence while neglecting the overwhelming number of ministers who pastor small churches in relatively obscure places that don’t have the where-with-all to rise above anonymity. Now, if we do have such problems, then it is only right to reconsider the re-formation of the SBC so that our primary focus can truly be on the kingdom of God through the building of healthy, growing churches. It is no use to tighten the nuts and bolts on a flat tire; it is no use to provide a new paint job when we have engine failure; and it is going to require a full-body inspection that can make the assessment whether our denominational vehicle needs more than a new fragrance. Yet, I want to be clear that the move from resurgence to re-formation is only a small part of the generational vision for a denomination halfly reformed. The fundamental matter before us today is to move from resurgence to re-formation to a true reformation of the local church. I know that reformation is a scary idea to a lot of people, especially to those who would be the recipients of such reform. However, would we to reject the call for ecclesiological reform, history informs us that the demise of the SBC is almost inevitable. First and foremost we must recover the gospel of Jesus Christ in our churches. The gospel has been suppressed and ignored through several agents, including semi-Pelagianism in the legacy of Finneyism in the SBC, unbridled pragmatism of the church growth movement, and unchecked nominalism whereby many have tipped their hat to the gospel in their “decision” but in no way is it normative in their lives. Second, we must re-emphasize biblical expository preaching in our churches. Ecclesiological reform would be most evident if the sacred desk would sound forth “Thus Saith the Lord” in all earnestness and exultation. Third, we must return to regenerate church membership in our churches. Statistics reveal that over half of our denomination do not believe attending church on Sunday’s is part of being a church member; half of those who do attend worship do not attend Sunday School. The integrity of the church requires an intentional and deliberate effort to hold all church members accountable to the faith they profess and the community of faith they belong. Fourth, we must rediscover church discipline in our churches. Perhaps the single biggest reason why we have failed to see revival in our day is that we have unhinged the front door and sealed the back door. When churches begin to deal with sin in the camp, we will see more of the front door closed and the back door open, repentance and confession common and gossip and slander uncommon, passion for corporate holiness and a dismissal of sin management. Fifth, we must reconsider plurality of elders and church government in our churches. The New Testament witness is clear that multiple elders were in every church whose primary role was to teach and exercise authority in a congregational setting. The current setting of committee-driven churches, pastor-as-autocrat churches, and deacon boards as elders are not prescribed anywhere in the Scriptures. Six, we must renew our passion to communicate the glorious good news of Jesus Christ in our postmodern culture. Such renewal includes a perspective that all members have been entrusted as stewards of the gospel to the world in which they live. Evangelism and missional living must become more than a once-a-week program with an attractional emphasis. These are some of the crucial areas that I believe must become the areas in which we focus our attention if we are going to see ecclesiological reform take place in the churches of the Southern Baptist Convention. I realize that many will dismiss this vision as too bold and highly improbable, and the desire to implement such a vision would come at the cost of being forced out of the Southern Baptist Convention. I am reminded that Luther, who did not desire to leave the Roman Catholic Church, was eventually excommunicated. Furthermore, the 17th century Puritans who sought to reform within the Church of England (the original “halfly reformed” denomination), eventually suffered under the Great Ejection, imprisonment, and even death. Yet, we would be wise to consider the outcome of both the Roman Catholic Church and the Church of England today. Who is blogging a tribute to either of these wings of Christendom in the 21st century? Now think of the legacy of Martin Luther and the Puritan Divines who, although dead, yet still are speaking and influencing scores of Christians across the world hundreds of years later (of whom I am in the ranks). Should the Lord tarry, has any of us given thought to what the legacy of the Southern Baptist Convention would be 490 years from now? The fact is my generation in the SBC is positioned to see a reformation take place that could shape the legacy of the SBC for years to come. Southern Baptists will have to make the decision, however, either to follow in the path of the Roman Catholic Church and the Church of England in rebellion to reformation, or to chart a course in history that embraces reform and builds on the resurgence we have experienced for the past three decades. Jesus, who has shown Himself sovereign in history and Lord of the Church, will continue to build His Church. I pray that we as Southern Baptists would be so postured as a people who understand the importance of semper reformanda that we would not miss what He has in store for generations to come.